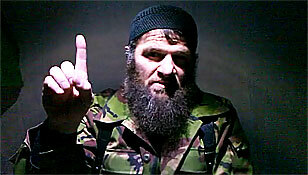 Doku Umarov, the leader of the Caucasus Emirate, from his videotape claiming credit for the Jan. 24, 2011 suicide attack at an airport in Moscow. The leader of the Islamic Caucasus Emirate took credit for the deadly suicide attack at an airport in Russia’s capital late last month. In a videotape released on the Internet, Doku Umarov, the emir of the al Qaeda-linked Islamic Caucasus Emirate, claimed the Jan. 24 suicide attack at Domodedovo International Airport in Moscow that killed 35 people and wounded scores more. The video was posted at the Dailymotion video site and announced by Kavkaz Center, a propaganda outlet for the Caucasus Emirate. The tape was recorded on Jan. 24, the same day as the Moscow suicide attack, according to Kavkaz Center. “This special operation was carried out on my orders and, Allah willing, special operations like it will continue to be carried out,” Umarov said. Umarov said that “Zionist and Christian regimes” were attacking Muslims worldwide, and noted that the succession vote in South Sudan was just the latest example of the West attempting to dismantle Muslim nations. The release of Umarov’s tape took place just three days after the Caucasus Emirate released a video of their leader meeting with Khamzat, the commander of the Riyad-us-Saliheen Martyr Brigade, the terror group’s suicide squad; and Saifullah, a suicide bomber. On that tape, Umarov said that Saifullah was preparing for a “special operation” inside Russia. Saifullah appears to be the Caucasus Emirate’s suicide bomber for the Domodedovo International Airport attack. Russian police have yet to determine the identity of the suicide bomber, however. Last year, Umarov issued a similar warning to Russia after he took credit for a suicide attack in Moscow’s subway. The double suicide attack in Moscow’s metro on March 29, 2010 resulted in the deaths of 39 people and hundreds more wounded. This just goes to show that these thugs aren’t just our enemies, they are everybody’s enemies. We must be PROactive, and not REactive when fighting them. It’s would help to get the Russians on board with US to the best extent possible in putting down this menace that both we and the Russians now face. James I believe as far as extremists go they have been on board for a long time. One problem they have is whenever they react we judge them on a human right’s issue. That is somewhat ironic since we don’t judge ourself’s that way. What I an saying is if we truely want there cooperation we should leave the politcal BS aside. They are somewhat heavy handed but so is there enemy. Only if we stop interfering in the Russian sphere of influence by backing the likes of Saakashvili. Further to James’ point, it has bothered me for many years how some of the worlds great powers have been content to be hung separately by the jihadis. The Russians suffer with theirs, the Chinese with theirs -content to let the US battle on. The Europeans support our efforts variably – some strongly like the UK, some, like Spain, quit altogether and opt for appeasement. None seem to get the implications of the unified Islamist ideology. I think that the jihadis will prosper until they either win or manage to unify us. I whole-heartedly agree with James and the others posting this thread. The United States and Russia are not natural enemies, but always something arises to make strong cooperation between us difficult. Frankly, off the top of my head, the only issues I have with Russia are ONE: That I feel they should return to Japan some of the Kurile Islands they took over after WWII. And I certainly would be behind the scenes on pushing that. And TWO: That they should be less cozy with the present Islamic regime in Teheran. Otherwise, the U.S. and Russia should be working intimately with one another regarding the World-wide War on Terror with an eye towards winning it as opposed to merely deflecting or preventing the next terror attack, and the next one after that, and the next etc. etc. I’m struck by his use of harsh creepy overhead lighting to accentuate his evil-ness. Very effective. Now kill him. NATO, Russia, ASEAN, India, Australasia should unite to fight this hydra headed monster. We are fighting our lone individual battles, sometimes even smiling when our ‘competitors’ are harmed by the very same enemies. Our enemy is the same, but yet we shirk from forming an alliance. The countries mentioned above are competitors, not enemies. Lets keep our competition aside for a while and unite to destroy our common ENEMY! The first step is to identify our enemies, naming a few here myself: China, Pakistan, Iran, Jihadi cultured countries, N. Korea, Taliban, AQ, Arab countries not willing to give up their funding and volunteers for these terror organizations. Once we identify these enemies, we have to form a consensus and harm their interest wherever and whenever possible! !